I’m not usually a fan of biographies. I prefer fiction than nonfiction, and I usually get bored reading about someone’s life, even if it’s someone that I admire. When I picked up Jessie Hartland’s new graphic biography of Steve Jobs though I was captivated! Steve Jobs: Insanely Great tells the story of Steve Jobs in a unique and exciting way, using a graphic format that will appeal to teens and adults alike. The book starts with Steve’s early life, when he was a mischief-maker and tinkerer, and it takes us through his teenage years, his short time at college and the businesses that he started from the ground up. The book is full of Steve’s achievements, his ups and downs, the people that he met and who influenced him, inspirational quotes, and a visual history of technology. You get a real sense of how Steve Jobs thought and what he wanted to achieve. Steve Jobs’ life was absolutely fascinating! He knew what he wanted and strived for it, from starting Apple Computer in his parents’ garage to creating cool gadgets that revolutionised the music, phone and tablet computer industries. He was always looking to create new and exciting things and wanted to make technology that was better than anything before. He made millions of dollars (and lost millions) along the way. One of my favourite aspects of Jessie Hartland’s book is that he takes you through the development of technology over Steve Jobs’ lifetime. Jessie shows us the history of computers and computer games and how Steve developed his Apple computers. Jessie also gives us a visual history of technology, from the 1960s when Steve was a child, through to the 2000s. Steve Jobs: Insanely Great is a brilliant book about an icon who brought us some amazing technology that most of us couldn’t live without. Give this book to the technology-crazy person in your life. Wearable Wonders is Fifi Colston’s fantastic new book that’s bursting with creativity, tips, tricks and ideas to help you make your own wearable wonder. Fifi has been in Christchurch this week, running workshops for children as part of the TV2 KidsFest, and I got the chance to have a chat with her. I’m a huge fan of Fifi’s books and I grew up watching her on What Now. Thanks to the wonderful publisher of Wearable Wonders, Scholastic NZ, I have a special signed copy of the book to give away. All you have to do to get in the draw is enter your name and email address in the form below. Competition closes Wednesday 31 July (NZ only). Thanks to everyone who entered. The winner is Sandra Worthington. Are your kids crafty and creative? Are you looking for that perfect idea to keep your kids entertained for hours these school holidays? Wearable Wonders is Fifi Colston’s fantastic new book that’s bursting with creativity, tips, tricks and ideas to help you make your own wearable wonder. As Fifi says in her introduction, this isn’t a book with patterns that show you how to make something in particular, it’s about showing you ‘how you can come up with an idea for something you’d never dreamed of making before.’ There are plenty of examples of wearable wonders that Fifi and others have created to show you what can be created from materials that you might have lying around the house. Fifi has split the book up in to lots of sections so that you can work through your masterpiece from start to finish. The first section is all about how and where to find good ideas, and Fifi gives some great tips about tips to help inspire you. Once you have your idea, Fifi then takes you through how to plan your time, shows you the tools and materials that you might need to create your masterpiece, shows you how to construct it, looks at what other accessories you might need to complete your look, and how to paint it. The last section looks at staging a wearable art show and the things you need to pull it all together. There is so much to like about Wearable Wonders. The information is clear, simple and easy to follow. I especially like the way that the text is arranged in small blocks, on pieces of paper that look like they’ve been pinned or taped to the page. The text is surrounded with lots of colourful diagrams and photos, with arrows matching photos and descriptions. It’s the sort of book that will appeal to kids, teens and adults because it’s so user-friendly. I’m not a crafty person but Fifi makes it look easy to create something wonderful from recycled materials. Grab a copy of Wearable Wonders from your library or bookshop and create your own masterpiece. It’s the perfect way to spend the school holidays or a rainy weekend. Take the SLIME TEST and find out. – Have you ever wondered where ideas come from and how stories are made? – Would you like to know the true stories behind some of Andy and Terry’s books and characters? – Would you like to discover 45 great ways to have fun with words and pictures? SCORE: If you answered YES to any of these questions, then this is definitely the right book for you! If you answered NO to all of these questions then you are an IDIOT and this is DEFINITELY the right book for you! The book is aimed at kids so it’s easy to read and great to dip in and out of. It’s also a great resource for teachers as there are heaps of great writing ideas that are quick and fun ways to get kid’s imaginations flowing. I tried using some of the activities on the Christchurch Kids Blog last week as a school holiday activity and got some really cool writing from the kids. Check out their Andy Griffiths Writing Challenge samples and why not try them yourself. Grab a copy of Once Upon a Slime from your library or bookshop now and let your imagination run wild! With the weather getting colder and wetter it’s great to have something crafty up your sleeves to entertain your children. I was pretty useless at art as a kid (and still am) but my dad helped me make some pretty wicked crafty creations. There are some great art and craft books around and our library shelves are always bursting with them. Candlewick Press have just released a really cool new craft book by Marthe Jocelyn, called Sneaky Art: Crafty Surprises to Hide in Plain Sight. Sneaky Art is chock full of quirky yet simple craft ideas that kids will love to make. Marthe says that sneaky art ‘is quick to install and effortless to remove’ and that each project in the book is ‘meant to be displayed in a public place, for people you may know or may not know, in a made-you-look-twice spirit of fun.’ There are Fractured Faces that you can stick anywhere, tiny bunting for a teeny party, a teensy-weensy washing line, and miniature houses to place in unexpected places. My favourite idea is something I might just try in the library – Library Shouts. These are large speech bubbles, with sayings like ‘Best Book Ever!’ and ‘Read Me!’ that you can stick in books to make them jump out at you. The thing I love about all the ideas in Sneaky Art is that you can make them from stuff you already have at home, including junk mail, magazines, and Post-it notes. Part of the fun of making the things in this book is finding somewhere funny to leave them. Together you can plan your sneak art attack. Next time you’re looking for something to entertain your kids grab a copy of Sneaky Art from your library or bookshop. Anzac Day: The New Zealand Story – What it is and why it matters is a fascinating, beautifully designed, thoroughly researched, and very accessible book for New Zealand children about Anzac Day. It’s one of those non-fiction books that is both great for teachers to use in the classroom or for children to delve in to by themselves. Philippa has written it in such a way that it is accessible for children of different ages, from 8 years and up, with lots of images to break up the text. This book is different from other non-fiction books about Anzac Day and New Zealand’s involvement, as it looks at not only the past, but also the present and how we commemorate today. Everything you would expect to find in a book about Anzac Day is here – what it is and why we celebrate it, a timeline of the Gallipoli campaign, profiles of key New Zealanders who played a part, and statistics of casualties and deaths. However, it’s the focus on why Anzac Day matters and how we celebrate it now that really makes this book stand out. There is a whole chapter about how we remember the war dead with poppies and war memorials, and another chapter on Anzac Day commemorations both in New Zealand and around the world. There are also lots of fact boxes with tidbits of information about the animals at Gallipoli, Anzac biscuits, the New Zealand flag, and why the New Zealanders had ‘lemon-squeezer’ hats. There are lots of primary resources in the book (which makes it great for teachers), from photos and newspaper clippings, to soldier’s diaries and paintings. Philippa has created some incredibly helpful material at the back of the book too, including a glossary, bibliography, a list of helpful and authoritative websites, and a list of ‘More things to do’ to extend children’s understanding of the topic. Anzac Day: The New Zealand Story – What it is and why it matters should be in every home, school and library in the country. It’s a book that will be well-used and well-read. I think I wanted to be a writer because I was a reader, and I wanted to be able to write a book as well as read one. It frustrated and puzzled me for a long time that writing a book seemed as if it should be so easy – but it actually it takes a lot of work on the writer’s part to make it look that easy. There are lots of good things – can I have two? One is getting to do the best job of all, which is making stuff up and inventing places that you’d like to spend time in and characters whom you’d love to meet. The other is when someone writes or emails or comes up to tell you in person that they really liked one of your books. I love that we are a beautiful, free country where we can think what we like, say what we like, read what we write and write what we like. I love that we have beautiful beaches that aren’t all built up with skyscrapers and hotels. I love that we have wonderful books and great bookstores, cinemas and theatres and fabulous writers. I love that my family and friends live here, and my husband and three gorgeous daughters. I used to be a librarian myself, and I spent hours in them as a child, so I feel very at home in libraries. Not just the libraries I use most, but any library anywhere can make you feel welcomed and belonging as soon as you walk in. I’m also grateful that I can use them to find out all sorts of information that I need for writing non fiction, and for the background to fiction as well. Philippa Werry is a children’s writer whose non-fiction, poetry, stories and plays have been widely published, and also broadcast on National Radio. Philipp’s work has appeared in various anthologies and she has written over 100 pieces for the School Journal and other educational publishers. Her latest book is Anzac Day: The New Zealand Story (published by New Holland Publishers NZ) is a nonfiction book about Anzac Day, what it is and why it matters. Do you love history with all the horrible bits left in? Have you ever wondered where Christmas carols came from or why we have Christmas trees? Well all your Christmases have come at once with the latest edition of Horrible Christmas by Terry Deary and Martin Brown. There is so much in this book that I didn’t know about Christmas. Did you know that Father Christmas comes in down the chimney because Saint Nicholas was the saint of chimney sweeps or that Christmas pudding in the Middle Ages was spicy porridge? There are also lots of quizes and a game so that readers can test their knowledge about the different topics. Martin Brown’s illustrations always make me laugh and this book is chock-full of his Christmasy characters from through the ages. I especially like the illustration of a very fat Father Christmas trying to figure out how to squeeze back up a very small fireplace. 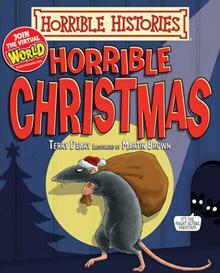 Horrible Christmas is a great addition to the Horrible Histories series that boys just seem to gobble up. They’re hugely appealing because they’re interesting, funny and gross. If you know a kid that says they don’t like reading, put Horrible Christmas under the Christmas tree for them and they’ll be hooked on this fantastic series. Like many other people around the world I’m incredibly excited about the release of the first Hobbit movie, An Unexpected Journey. What better way to get ready for the movie than delve into books about it. Like me, you could read the original book that inspired the movie, or you could read the wonderful new books that Harper Collins New Zealand have just released that take you inside the world of the movie. Here are four of these wonderful books, aimed at a variety of different audiences. The Hobbit: An Unexpected Journey – The Movie Storybook tells a simplified version of the story for children (or adults who want to know what the story is about). The story is accompanied by lots of stunning, full-colour photos of the characters and places from the movie, as well as maps of Middle Earth. The story is easy to follow and perfect for sharing with younger children who might not be ready to read the original story themselves. The Hobbit: An Unexpected Journey – The World of Hobbits introduces children to the creatures who are the heroes of both The Hobbit and Lord of the Rings, and tells you everything you always wanted to know about Hobbits. You can learn not only what a Hobbit actually is, but also what they look like, what their nature is, what they wear, why they have such big, hairy feet, where they live, what their home looks like, what they eat, and who their friends and enemies are. The writing is aimed at children so it’s basic and easy to understand, but incredibly interesting. I really like the layout, as there is a good balance of images and text on each page. There are plenty of full-colour photos of the characters and places, as well as maps, decorative borders, and even a Hobbit’s menu. The Hobbit: An Unexpected Journey Visual Companion is aimed at an older audience and incorporates information and images from the younger titles. It includes information about Hobbits (and Bilbo Baggins in particular), profiles of the other characters including Gandalf, each of the Dwarves and the Elves, a summary of their quest and information about the places they pass through, the enemies that they clash with, and a stunning map of Middle Earth that folds out. The thing that I like most about this particular book is that you learn more about each of the characters, like their personalities and why they look the way they do. Once again, this book is filled with full-colour photos of the characters and places from the movie, but you also get a more close-up look at the characters costumes and weapons. This hardback book is one to treasure and is the perfect gift for Hobbit fans young and old. The Hobbit: An Unexpected Journey Official Movie Guide is the perfect book for older Hobbit fans and movie buffs. This book gives a behind-the-scenes look at making this incredible movie. It includes exclusive interviews with director Peter Jackson, Martin Freeman, Ian McKellen, as well as the rest of the main cast and filmmakers, who share film-making secrets and tales of what it was actually like making movie magic in Middle Earth. Not only do you get photos from the movie, but also behind-the-scenes photos of the actors, locations, sets, creatures, and costumes. You learn about Peter Jackson’s journey to bring the story to life, how they got the right look for the characters and their costumes, how they decided which locations to shoot in, how they transform an actor into a Dwarf, and how they filmed in high definition and 3D. I could sit for hours reading this book and poring over all the stunning photos. Anything you would want to know about making a film is in this book and it’s incredibly detailed. With Gandalf gazing out at you on the front cover you can’t help but pick this book up from the shelf, and you won’t be disappointed if you do. There is a Hobbit book for everyone this Christmas, whether you are young or old. Grab one of these wonderful books to put under your tree this Christmas. Thanks to Harper Collins New Zealand I have 2 Hobbit prize packs to give away. You can enter the draw here. New Holland Publishers are one of the leading publishers of children’s non-fiction in New Zealand and their books are often nominated for the New Zealand Post Children’s Book Awards. Their latest gem is the wonderful Kiwi: the real story by Annemarie Florian and illustrated/designed by Heather Hunt. Kiwi: the real story is a marvelous multi-layered book thattells the story of Kiwi behaviour. Weaving its way through the pages is a poem about the Kiwi, full of beautiful descriptive language, like ‘gorging grubber’ and ‘cricket-cruncher.’ I love alliteration and this poem is chock-full of it, making it a joy to read aloud. Tying in wonderfully with the poem are the blocks of more detailed information on each page, which explain why the Kiwi is a ‘spider-wrestler’ and a ‘covert nestler.’ The design of the book means that you can read the poem and the information separately, or both together. Younger children will love the poem and the illustrations, whereas older children will also enjoy finding out more about the Kiwi. Heather Hunt’s illustrations are stunning. I find it amazing how she can make a bunch of squiggly lines look exactly like a Kiwi. I love the way that she shows the movement of the Kiwi on the page and the way that she brings out the character of this marvelous bird. The colours that Heather has used, from the bright green of the praying mantis to the blue of the egg, are vibrant against the black background, and the grey and white of the Kiwi makes it really stand out on the page. I especially like the way that she has used different colours to differentiate between the adult Kiwi and the baby Kiwi. Heather also designed the book and I think that it’s this design that really makes the book special. She has taken the three layers of the story and woven them together so that they can be enjoyed in unison. The words of the poem seem to dance around the illustrations, making the book extremely appealing to young children. The book is beautifully produced too, in a hardback format, with endpapers that look like the night sky. The character of the Kiwi in the story was originally created by Heather to be the ambassador for Backyard Kiwi, a project carried out by the Whangarei Heads Landcare Forum. The quirky design is used to personify the bird for road signs and billboards. You can learn more about Backyard Kiwi at www.backyardkiwi.org.nz and you can find out more about Heather and her working process at heatherhunt.co.nz/KIWI-the-real-story.